Designed specifically for the two-way and cellular service. 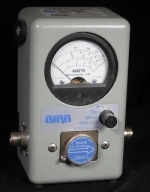 440-960 MHz, 1.5-50W, Portable Wattmeter, no elements to purchase as this meter comes with the only element that is needed. General purpose field power measurement from 440 MHz to .96 GHz and up to 50 watts. Uses a single permanent broadband element with a 4-position range switch, 1.5W, 5W, 15W, 50W. Same rugged metal housing as the Model 43. Quick Change (QC) connectors to minimize the need for adaptors when making critical measurements. Optional pelican case has storage for 50W Bird RF Load and connector/adapters.